The deep sea crunch fest takes to the skies in a brand new saga! The dragons are quirky and each has its own personality and style, much like the sharks! Many of our favorite elements still exist, but with a new twists. Pets are no longer purchased, but obtained though the collection of eggs. 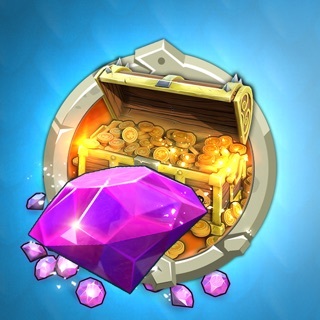 Many quests begin with temporary issue dragons putting all competitors on a level field possessing the same abilities, making competitions a game of skill and strategy rather then in app purchase ability. World wide cooperative events give players quest to work together to accomplish rewarding all participants. The game is addictive and fun to play, however, it does leave me wanting more. Granted this game is in the early release stages of development, but what immediately caught my attention was the graphics quality. I must say, it is a several steps behind Its predecessor. The overall quality is VERY grainy. I am playing on an IPad Air, and as such do not expect console level graphics, but I find myself feeling deprived that the game could not match the very smooth graphical quality of Hungry Sharks. I hope later updates will restore those graphics. There exists only one playable map at this time, while large and expansive, a change of scenery would be much appreciated. All being said, this game has much potential, and I hope the updates continue to aid it in achieving such! I totally love the concept of this game, and can understand its potential, but since it’s young, I have criticisms that are probably upgrades already in mind if the team, but I digress. Handling is different, which it’s probably supposed to be since you don’t want people who have mastered hungry shark coming to this game and instantly pulling the same scores as the other game. I have also noticed a harder survivability for younger dragons that’s not necessarily a part of the other game, also good since there’s less playable dragons at this time. I’m not totally a fan of time gated achievements since they’ve never been a thing before, but I’m not totally opposed to the concept. The additions of costumes was spot on. Completely different looks for the dragon with their own stat bonuses, keeps it nice and clean. The only grievances I would say I have is that the sensitivity is way weird. Scrolling and even trying to move as a dragon isn’t always reliable. Most of the time I’ll get where I’d like to be going but the dragon will stop moving altogether or not move at all. Also a larger number of teeny tiny prey items would be ideal as well. Interface wise, it seems a little clunky and flashy. But that’s just an opinion. Overall I’m really liking what it’s brought to the table being so young and can’t wait to see how this game grows! Now man is this a awesome game I love it! It’s amazing, but the thing is it takes forever to level up when ur a medium dragon. Like FOREVER. Now for all that good stuff it takes a medium dragon to eat a lot, but look at the bright side when ur a extra small dragon. For example u can still eat stuff like birds and other things like that. Ok ok last bad thing is it me or is it hard to get coins and the last medium dragon it was $260,000 and I had to save up a lot and now I’m on the last medium dragon, but it was a long time to get there. For some reason my older sister started one day after me and is already one the medium dragon. Again is it me or is it really hard to get coins? People reading sorry that it was a little long, but thank u for reading this. I had to think about the plot of writing this review. So if u ever ask me would I down load this game? The answer would be yes this game has caged my boredom to complete fun even when my sister is really bored and never wants to play video games she’s always down for this one. And oh boy is it really hard for her to find a great game with great graphics and great things. All I have to say now is download this game and make sure u tell everyone like family and friends about this amazing game.